Loss of BRCA2 affects genome stability and is deleterious for cellular survival. 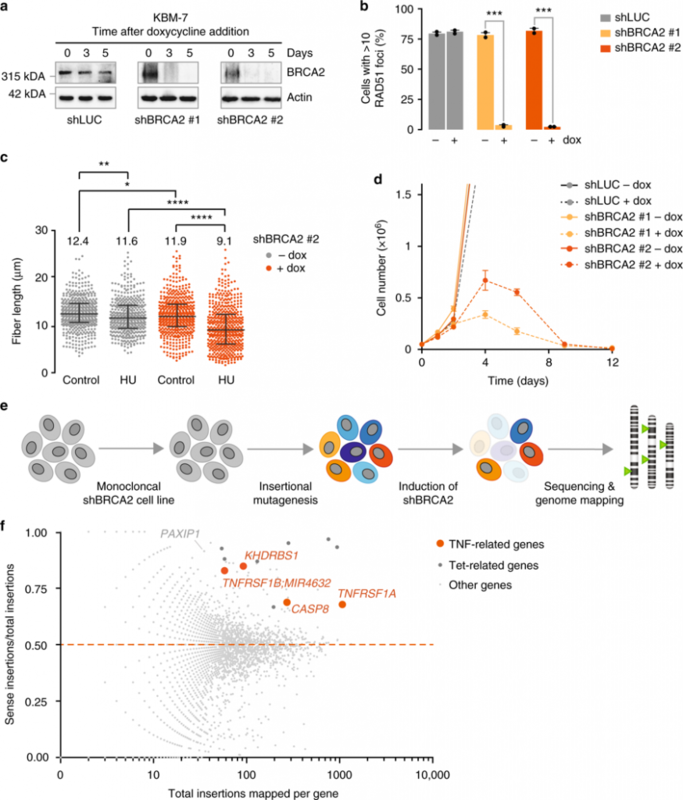 Using a genome-wide genetic screen in near-haploid KBM-7 cells, we show that tumor necrosis factor-alpha (TNFα) signaling is a determinant of cell survival upon BRCA2 inactivation. Specifically, inactivation of the TNF receptor (TNFR1) or its downstream effector SAM68 rescues cell death induced by BRCA2 inactivation. BRCA2 inactivation leads to pro-inflammatory cytokine production, including TNFα, and increases sensitivity to TNFα. Enhanced TNFα sensitivity is not restricted to BRCA2 inactivation, as BRCA1 or FANCD2 inactivation, or hydroxyurea treatment also sensitizes cells to TNFα. Mechanistically, BRCA2 inactivation leads to cGAS-positive micronuclei and results in a cell-intrinsic interferon response, as assessed by quantitative mass-spectrometry and gene expression profiling, and requires ASK1 and JNK signaling. Combined, our data reveals that micronuclei induced by loss of BRCA2 instigate a cGAS/STING-mediated interferon response, which encompasses re-wired TNFα signaling and enhances TNFα sensitivity. January 12, 2019 in Publications, Science.